From its floppy beagle-like ears to skid-resistant paw booties, this puppy costume is so doggone cute you’ll want your tiny tot to wear it nearly every day! As an added bonus, this costume features leg snaps for easy diaper change, plus slip-on booties with skid resistant bottoms. 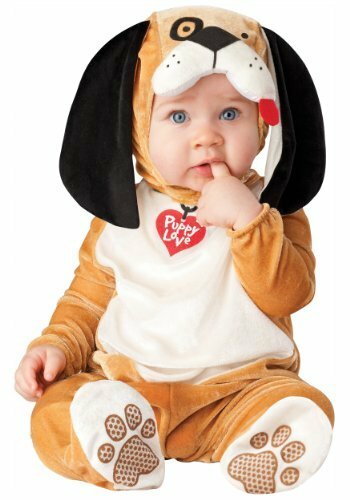 The infant Puppy Love costume includes the jumpsuit and hood with puppy ears. This baby Puppy Love comes in sizes Infant Small, Infant Large, Infant Medium. Inner leg snap closures on this adorable baby puppy dog costume make diaper changing quick and easy. The booties on this puppy baby costume have skid resistant bottoms (intended for indoor use only).